Welcome to the Fit Small Business Xero training course! 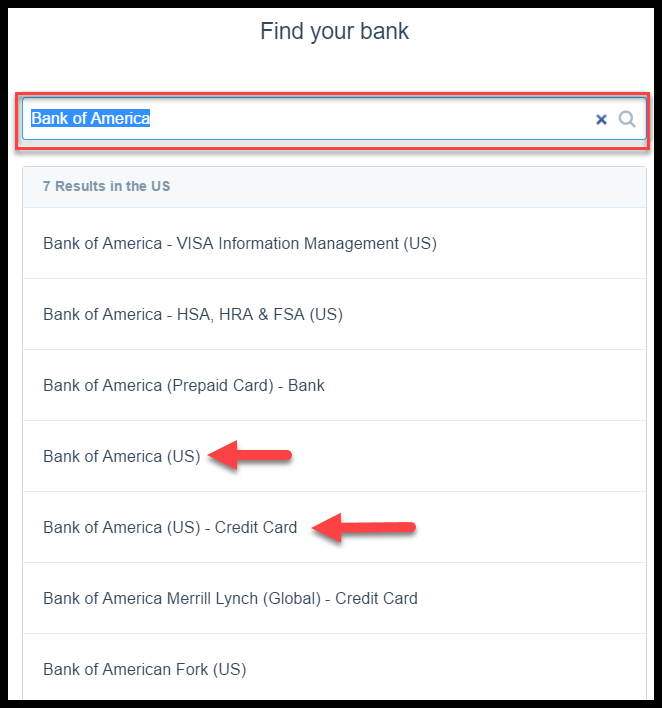 In this lesson, we’re going to cover how to set up bank feeds in Xero. Why Is It Important to Set up Bank Feeds? Most of the purchases that you make for your business are either deducted from your bank account or charged on a business credit card. Therefore, to ensure that every transaction has been included in your financial statements, you should set up all business bank and credit card accounts with an automatic bank feed that will import your bank and credit card transactions into Xero. By setting up an automatic feed, it will save you time that you would have spent manually entering transactions from your bank/credit card statement into Xero. 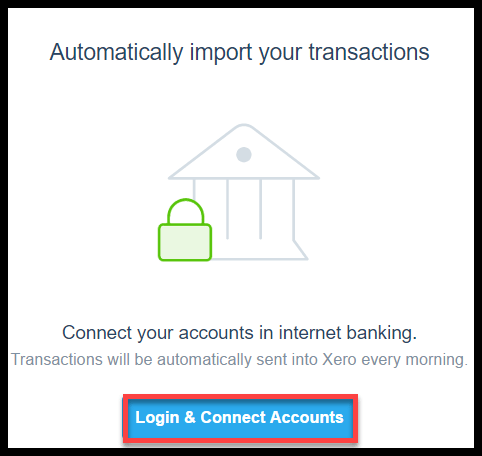 First, let’s discuss the 3 ways that you can import bank and credit card transactions into Xero. Direct feeds allow you to automatically download bank and credit card transactions into Xero from your bank or financial institution. The banks listed below currently support a direct feed to Xero. If you use one of the following banks, then you can head over to the Direct Feeds section for step-by-step instructions on how to set up a bank feed. If you do not use one of these banks, then read on. If you don’t bank with one of the three financial institutions listed above, you will use a third party called Yodlee to download your bank/credit card transactions. 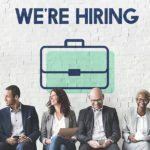 Yodlee integrates with Xero to connect thousands of online banking websites and financial institutions worldwide. Most small and larger financial institutions allow Yodlee bank feeds. 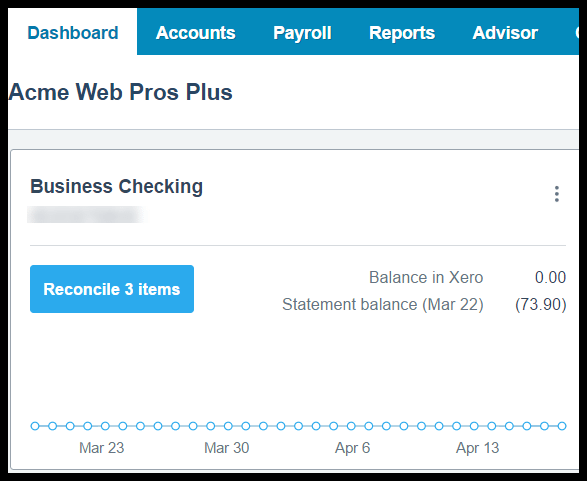 Note: While Xero does not charge to setup these type of feeds, your bank/financial institution may charge you a fee for this service. Despite the fact that they’re a 3rd party service, setting up a Yodlee feed is just as easy as a direct feed. We provide step-by-step instructions for this below. Like direct feeds, Yodlee feeds will update your bank transactions at least once per day. 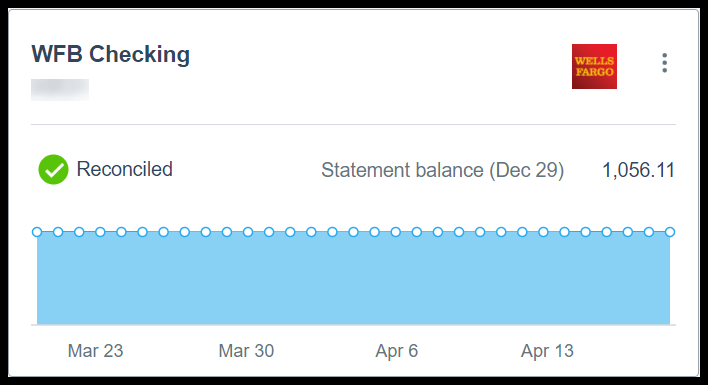 If you are not able to set up a direct feed or a Yodlee feed for your bank/credit card account, then you can import your monthly bank/credit card statements into Xero from a file. In order to do this, you will need to request an electronic copy of your bank/credit card statement in one of the following formats. The formats that work the best are marked with an asterisk (*). The only users that can add a bank (credit card) account are the Standard user and the Advisor. To learn more about user permissions, check out our How to Invite a User lesson for more details. 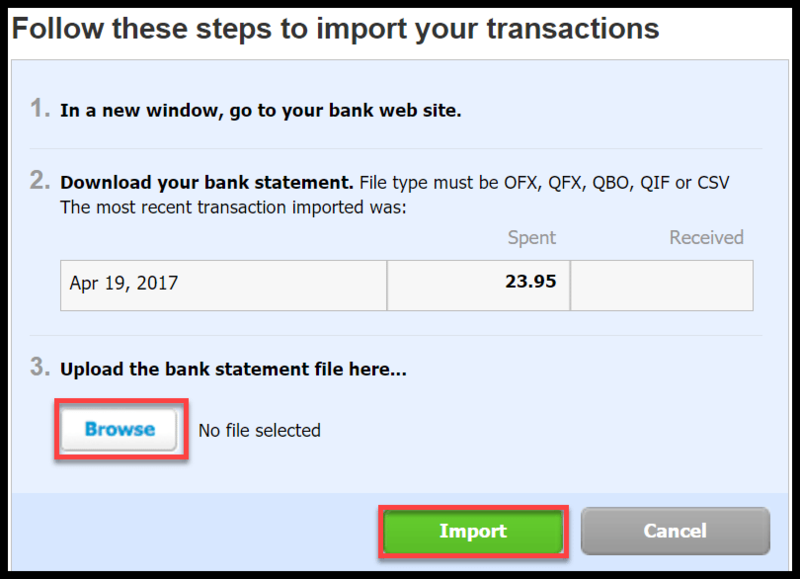 Below are step-by-step instructions on how to set up direct feeds, Yodlee feeds, or import a bank/credit card statement. Below, are the steps that you need to follow to set up a direct feed for a bank or credit card account. 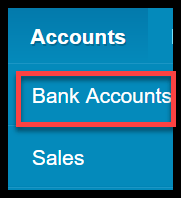 From the Accounts menu, select Bank Accounts as indicated in the screenshot below. In the search box, type the name of your bank/credit card as indicated in the screenshot below. Note: Your bank may be listed several times so be sure to select the correct one. Click the blue Login & Connect Accounts button to proceed to the login screen. Next, you will see the login screen for your bank or financial institution. 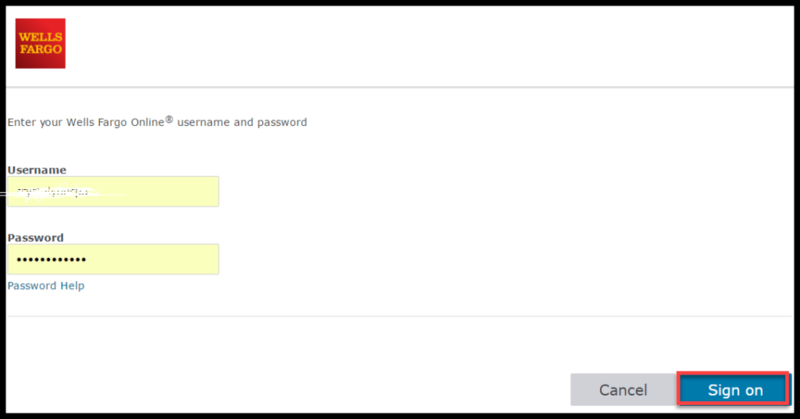 Enter your login ID and password and then click the “Sign On” button as indicated below. You have the option to connect any new bank/credit card accounts that you open at the same financial institution, using the same login credentials. Note: This option is automatically selected so be sure to remove the checkmark if you don’t want to set this up. Click the “Continue” button as indicated below. In the next screen, you will see a list of accounts that will be set up with a direct feed to Xero. You must accept the terms and conditions and then click the “Connect my Accounts” button to proceed. Similar to direct feeds, the steps for setting up a Yodlee feed for a bank/credit card account are identical. Below, are the steps that you need to follow to set up a Yodlee feed for a bank/credit card account. You will need to enter an account name, the bank/credit card account number and the currency as indicated in the screenshot below. Account Number: Enter the full account number in this field. Note: Do not include any slashes or dashes in this field. Currency: Select the currency that you would like to use to track the bank/credit card activity. One of the many benefits of using Xero is that it has a robust multi-currency feature that allows you to track foreign bank and credit card accounts. Check out our multi-currency lesson to learn more about how this works. Continue: Once you have completed all 3 fields, click the “Continue” button. In the following screen, you will need to log into your bank/credit card account. Online ID and Passcode: Enter the login ID and passcode that you use to log into your bank account. 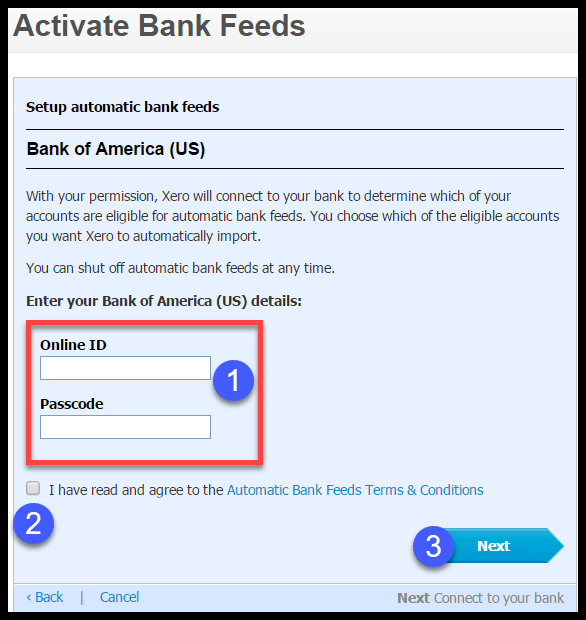 Automatic Bank Feeds Terms & Conditions: Click the blue link to read the terms and conditions and then put an X in the box to accept the terms & conditions that you read. Below, we have provided a screenshot along with a brief description of the selections that you need to make next. Select the matching bank feed – From the dropdown, select the bank/credit card account that you would like to set up an automatic bank feed for. Unlike direct feed, you have to individually select the bank/credit card feed and repeat the process for each bank. Import Transactions starting from – From the dropdown, select the start date that you would like to begin downloading transactions from. Note: This will be determined by how far back your bank/credit card company will allow you to go back and download transactions. All available transactions – By selecting this option, Xero will download up to 3 months worth of transactions. 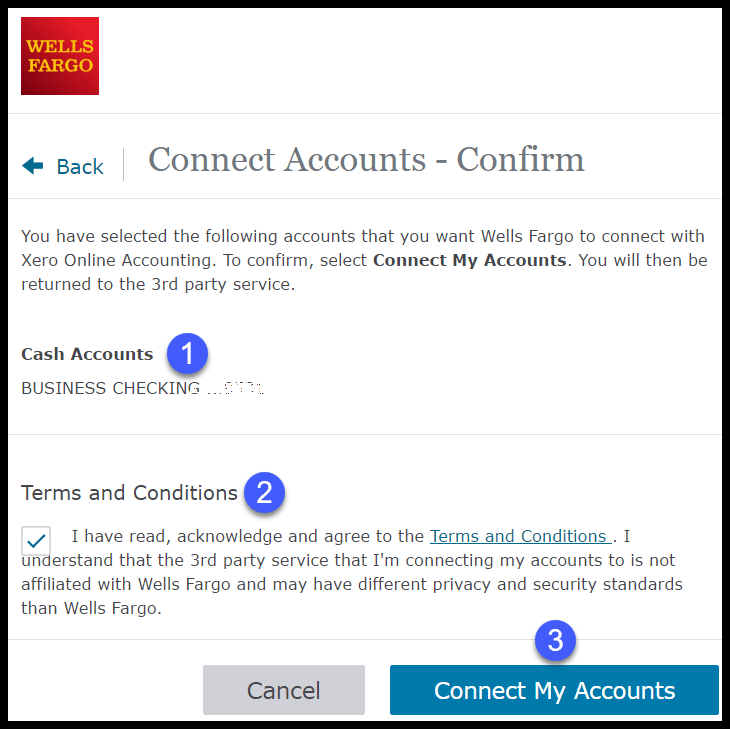 Cancel Activation – You can cancel bank feeds at anytime for any bank/credit card account. Click the “OK” button once you have made your selections. You should see the following message confirming the activation of the bank feed. As indicated below, you will receive a notification once all of your bank/credit card transactions have downloaded. Note: This process can take anywhere from a few minutes up to 1 hour. Note: Be sure to review these troubleshooting tips on how to refresh a feed if it crashes. 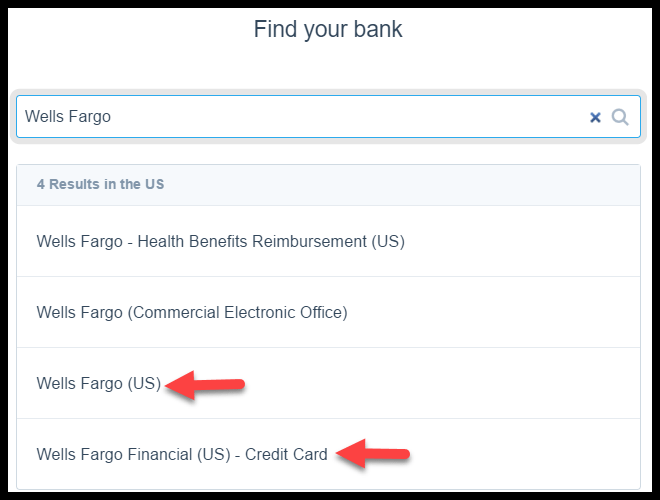 Below, are the steps that you need to follow to import a bank/credit card statement in Xero. Download an OFX, QBO or QFX bank/credit card statement from your financial institution’s website. If none of these formats are available, you can click here to learn how to download a CSV file. If you have multiple bank/credit card accounts, be sure to download a monthly statement for each account separately. If you are downloading an OFX, QBO or QFX file, no modifications to the file are needed, simply save it and proceed to the next step. If your file contains more than 1,000 transactions, you will have to split up the file into two. Follow these steps to import your bank/credit card statement into Xero. A. Navigate to Accounts and select Bank Accounts as indicated in the screenshot below. B. Click on the “Manage Account” button and select Import a Statement as indicated in the screenshot below. C. Click on the “Browse” button in step 3 and locate your saved file as indicated in the screenshot below. Once you have located your file, click the “Import” button to proceed with the import. Note: In the screenshot below, the second step shows you the date and the amount of the most recent transactions imported. This can be helpful to ensure that you know your starting point for the next file import. 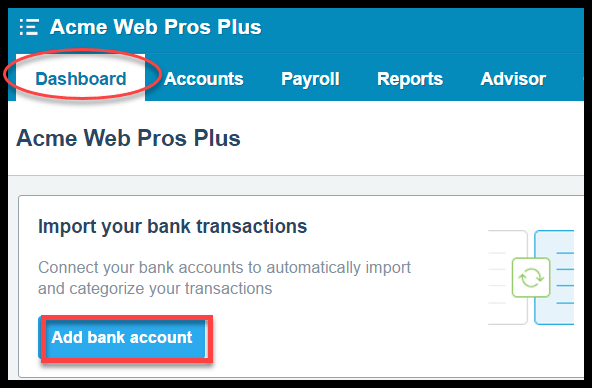 If you need to make changes to a bank/credit card account, you can do that from the bank accounts screen or from the chart of accounts. In this lesson, we will show you how to edit a bank account from the bank account screen. Click on the “Manage Account” button and select Edit Account Details as indicated in the screenshot below. 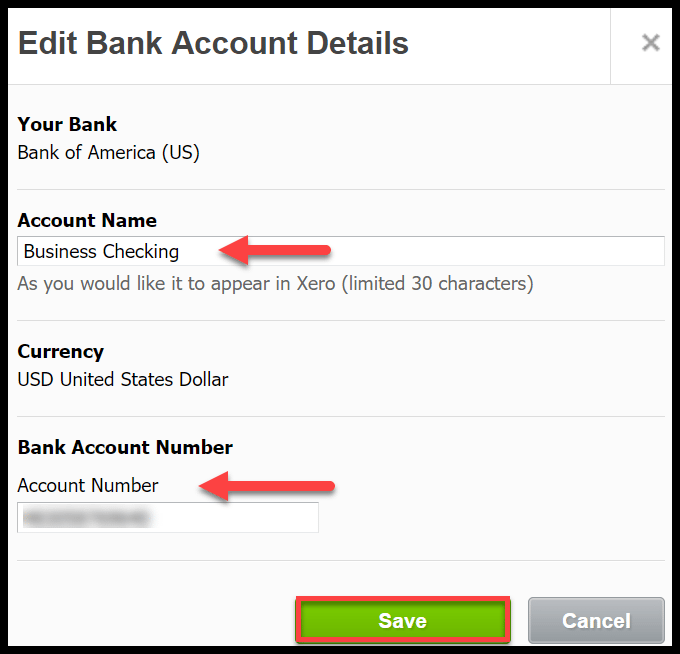 In this screen, you can edit the account name (as it appears in Xero) and the bank/credit account number as indicated in the screenshot below. Once you have made the changes, be sure to save your work. If you close a bank/credit card account, you can delete it in Xero if you have never posted any transactions to it. 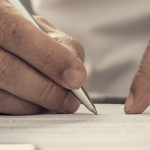 However, if you have posted transactions to a bank/credit card account then you will not be able to delete it because of the impact it will have on your financial statements. Instead, you can archive an account that you no longer plan to use; this will remove the account from the chart of accounts list and any account dropdown while working in Xero. However, it will still appear on financial statement reports. Later on, if you decide to use the account again, you can easily restore (unarchive) an account that was previously archived. For step by step instructions on how to delete, archive or restore bank/credit card accounts, watch our How to Set Up a Chart of Accounts lesson. 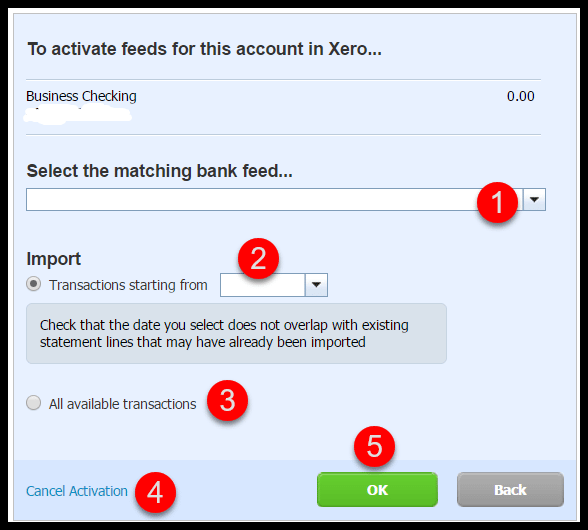 That wraps up the section on How to Set Up Bank Feeds in Xero. The next lesson in our Xero Training Course will be How to Manage Downloaded Banking Transactions. In this lesson, we will walk you through how to categorize and manage transactions that you have downloaded from your bank/credit card accounts. To access this lesson or any of the others in the series, click here. For a free 30-day trial of Xero, click the button below.